20ft shipping container converted into office with secure sorting area underneath. The 20ft container office – an easy way to expand your business’ space. This 20ft container office conversion helped a logistics company solve a lack of space problem – could it do the same for your business too? The challenge for the customer, a well known UK logistics company, was that they needed a way to create another office within their warehouse. They knew that a converted 20ft shipping container would be an easy and economical way to achieve this, but there seemed to be no room available in the warehouse for the container. Raising the container office off the floor, and making use of the area below. The solution was to supply a converted 20ft container office, complete with staircase, and mount it onto a custom converted flatrack. This meant the floor area used was doubled in capacity. The flatrack was also fitted with caging mesh, this provided a secure sorting area underneath the 20ft container office. By combining the 2 types of containers and adding the mesh the customer was able to retain their sorting area space, make it more secure, and gain an additional 20ft container office for their team. 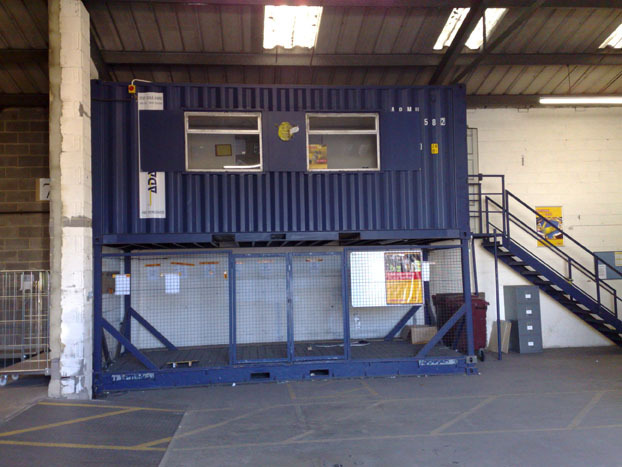 Do you have a container conversion idea that we can help you with?